The making of photographs of the ground surface from an aircraft, spacecraft, or rocket. Also known as aerophotography. 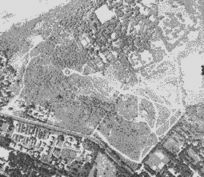 Various types of aerial photographs. A photographic print or picture of an object, or of a source of radiation, on the earth's surface, developed from a film previously exposed in an airborne vehicle. In narrower terms, it is the act of taking photographs of objects on the ground from the air by aerial cameras. 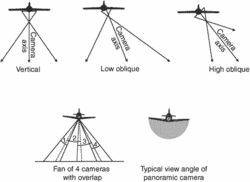 In this category, there are four types of aerial photographs: vertical, oblique, fan, and panoramic. Vertical photography is used for mapping, locating objects that are camouflaged, and getting the exact scale of objects. It is the main source of reconnaissance. Oblique photography is used for tactical purposes and involves taking photographs by cameras looking sideways or through nose camera(s). Fan photography uses a combination of vertical and oblique camera installation. A panoramic photograph covers a strip of land from one horizon to the other. The other types of aerial photographs are infrared photographs, radarscope photographs, video photographs, and thermal photographs. Passport photos, classes, repair, equipment rental, video transfers, restoration, a portrait studio and even aerial photography have made them the definitive dealer in the state of Arkansas. service for photogrammetric scanning, georeferencing, documentation, metadatacin, flight management system and cargo in the same fund municipal file aerial photography, under the National Plan of Air orthophotograph (PNOA) contract. PHOENIX -- GlobeXplorer's AirPhotoUSA today announced the first comprehensive collection of 1-foot resolution aerial photography for the nation. of Perth, Australia, a team member on this contract, will be responsible for the acquisition of aerial photography over critical infrastructure in 35 individual sites throughout Papua New Guinea. Announcement of competition: Aerial photography of Stavanger municipality covers an area of 140 km, of which 71. AirPhotoUSA announced the release of PhotoMapper(R) aerial photography with one- and two-foot resolution for several key California regions, including San Diego, Los Angeles, San Francisco, San Bernardino, Lake, Orange and Riverside counties. Prior Information Notice without call for competition: Prior notification of a digital aerial photography, as well as trees interpretation of the acquisition. Pictometry provides a high-impact aerial photography software solution that allows non-technical professionals in a response situation to immediately benefit from the easy-to-use system," said Wilkinson. With GIS mapping and aerial photography, bidders have more information available on each property," said Ross Jacobs, Yavapai County Treasurer. Contract notice: Aerial photography of the machine airworthiness monitoring, operation and maintenance.